Charlie Bethel's one-man version of The Odyssey, which he adapted and performs, is an eye opener (no pun intended). I of course was familiar with the Greek epic poem from high school and college lit classes - you remember, it's the the one about the ten-year long sea voyage involving the one-eye Cyclops, the island of the Lotus-Eaters, the evil Circe (Cersei?) who turned men into pigs, the dangerous call of the Sirens, etc. etc. But this version allowed me to see the story in a whole new light. 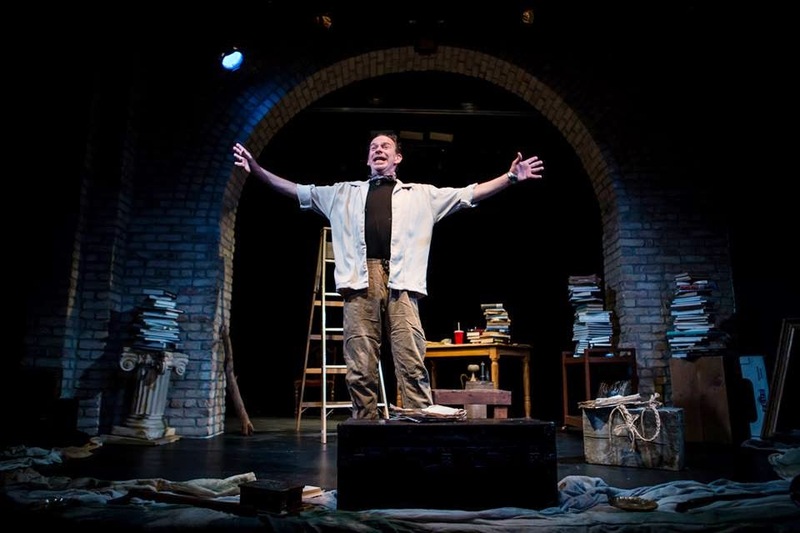 In two hour-long acts, Charlie spins this tale like a master storyteller, making it fun and accessible and compelling. He makes no pretense of the fact that he's telling a story to us, and in that sense it feels like the most ancient form of theater - storytelling. We could have been sitting around a fire or in a cave, except for the modern language mixed with traditional phrasing. A quick primer for those of you who don't remember your high school or college lit class, The Odyssey recounts the journey of Odysseus as he endeavors to return home to Ithaca after the Trojan War (the subject of another excellent one-man show, An Iliad, starring Stephen Yoakam at the Guthrie last year). Odysseus angers the gods, and they curse him to wander the seas for ten years before he finally makes it home after losing all of his men and ships, only to find his house filled with suitors eating his food and wooing his wife Penelope. It's a story that's filled with much tragedy, as Odysseus watches his men being eaten by a variety of ogres and perishing in the sea, but this version is quite light-hearted. Charlie tells it with a wink at the audience, skipping over parts, giving us hints of what's to come, and pausing the story to explain inside jokes. His carefully metered speech is a thrill to listen to, every gesture and movement meaningful, as he casts us under his spell. He makes direct eye contact with the audience, thanks us for getting a joke, and encourages us to recite the phrase "rosy-fingered dawn" along with him. He leads us through all of Odysseus' travails, playing all the roles, and casting Odysseus as a bit too curious and bold for his own good. It ends with a poignant reunion as Penelope finally welcomes back her Odysseus, after testing him to make sure he's really who he says he is. The moral of the story is, "You don't give up, because someone needs you bad." The small stage at Open Eye is as crowded as I've seen it. Filled with stacks of books, chests and blocks of wood, a classic column, and a ladder that serves to give height to the Cyclops, which tipped on its side functions as a boat. Each prop has its place in the storytelling - a pile of ancient looking paper thrown in the air becomes a hurricane, a worn piece of fabric becomes a scarf or a sail. I just happened to attend on a night with ASL interpretation, and even though I don't understand the language, it was almost as fascinating to watch the theatrical performance of Claire Alexander as she translated the words into moving poetry as it was to watch Charlie on stage. 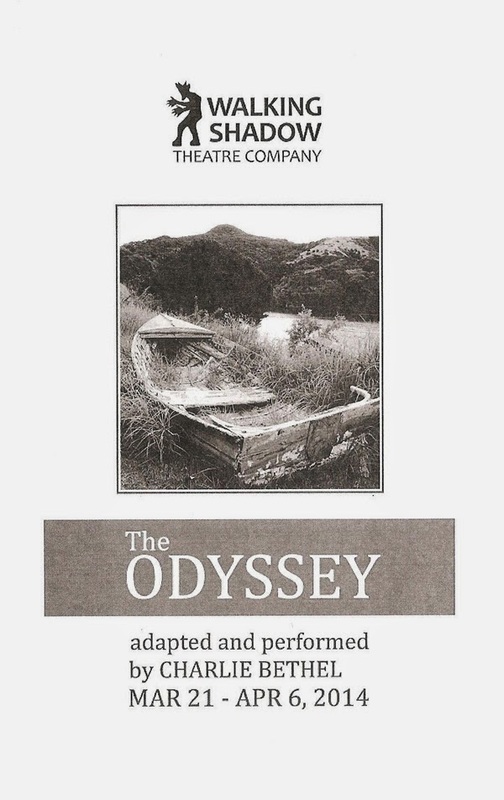 Charlie Bethel's unique version of The Odyssey is produced by Walking Shadow Theatre Company and continues through April 6. Check it out for an entertaining journey through a familiar story.